The puréed sweet potatoes accompanying the seared ahi were suprisingly tasty. Hours: Tue.-Thu. 5:30-9:30 p.m.; Fri.-Sat. 5:30-10 p.m.
Every year there's a certain day in early spring when the rains that have been drenching, battering, and otherwise depressing the San Francisco Bay Area for the past several months come to a sudden halt. The chill in the air melts as the sun comes out and basks the landscape, and there's a hint of honeysuckle in the breeze. Fleece and Gore-Tex give way to white cotton and bare flesh, people sunbathe in the parks and stroll the boulevards with no destination, and the world seems ripe with possibility. On a day like this it's only natural to head to Doña Tomás, the closest thing in Oakland to a bougainvillea-draped courtyard in Xochimilco or New Orleans or the West Indies. 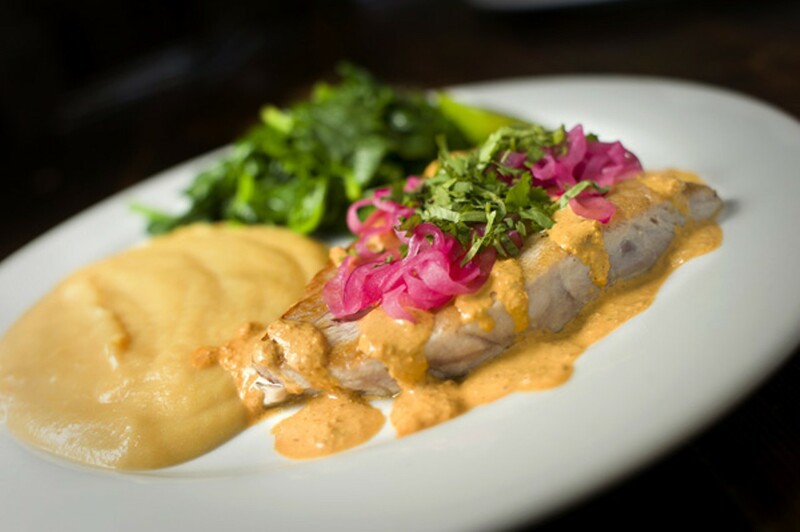 Since 1999, when co-owners Dona Savitsky and Thomas Schnetz opened the place and singlehandedly gentrified the Temescal neighborhood, hordes of the thirsty and hungry have been feasting on the restaurant's singular nouveau-Mexican/California cuisine in a fun, festive, upscale-rustic setting. During a recent visit the mood was as merry and enticing as ever, but the food, while often tasty, lacked oomph and spice and the rich satisfaction one associates with both classic and casual Mexican cooking. The restaurant is an attractive warren of chambers and spaces, each of them unique. To the right is a tiny bar area with big windows and blood-red walls and wrought iron chandeliers. To the left, a dining room in rough wood, faux adobe, Mexican textiles, and sturdy Mission-style tables and chairs. Down the middle is an attractive breezeway/foyer/waiting area, and out back is the courtyard, the place to be on a warm spring evening. The burbling fountain, exposed brick, bas-relief walls, and rambling ivy are conducive to repose and whistle-wetting, and immediately adjacent is a corrugated garden shed-turned-dining room done up in wicker, birdcages, and dahlia-patterned plastic tablecloths. We kicked off our meal with a complimentary basket of crisp, delicate tortilla chips strewn with grated cotija cheese and served with a hearty (if less-than-peppery) salsa. Warm quesadillas stuffed with tender shredded chicken, fresh cilantro, Oaxacan cheese and an earthy yellow mole sauce made another delicious starter. But the fundido de camarones (broiled cheese with shrimp) was difficult to eat, with its thick sheet of melted queso over a pool of unexciting salsa, and the sopes con hongos y nopales was a ponderous dish of lukewarm masa cakes laden with cactus, mushrooms, black beans, and cabbage. Among the entrées was a moist and tender filet of seared ahi served with a subtle salsa of chile, sesame seed, and pumpkin seed; a tangle of earthy sautéed spinach; and surprisingly tasty puréed sweet potatoes. Despite the slightly chewy and under-seasoned nature of the beef itself, the Niman Ranch carne asada wasn't bad, especially when you factored in the extra-rich scalloped potatoes, the smoky-sweet and slender grilled asparagus, and the awesome poblano cream sauce that shared the platter. But the black mole stew was a disappointment. Mexico's signature culinary creation, a deep, complex balance of pepper, spice, seeds, nuts, chocolate, and tradition dating back to the Aztecs, tasted burnt and pallid in this case, overwhelming the juicy scallops, the ponderous masa dumplings, and the al dente green beans and carrots that shared its pot. Our favorite dessert was the nieve de chocolate con maza de galleta, a big elaborate goblet's worth of ice cream sundae featuring Ici milk-chocolate gelato, healthy dollops of Toll House cookie dough, a drizzle of cinnamon-scented Mexican chocolate sauce, and whipped cream to gild the lily. The manzana frita was just undercooked, over-battered fried apple rings with a little bit of caramel and a scoop of ice cream, but the pay de lima was marvelous, nothing but a nicely puckery lime mousse presented in a rich and buttery graham cracker crust. 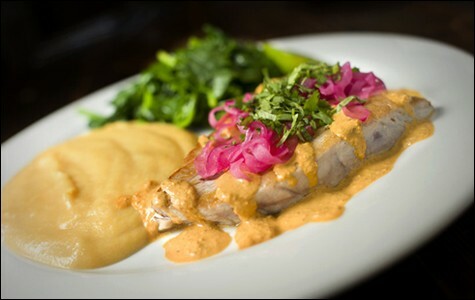 In addition to all that carne, pollo, and pescado, the menu offers several meat-free dishes for the vegetarian diner. Toasted pumpkin seeds with chile and garlic and fresh jicama with chile and lime are available for pre-meal nibbling. Appetizers include tomato-cilantro guacamole, the masa cakes with nopales, and an elaborate salad of beets, avocado, blood orange, arugula, and queso fresco. Among the entrées are chiles rellenos stuffed with leeks, green garlic, raisins, and three kinds of cheese, and a tostada topped with yams, chiles, onions, black beans, and green salsa and served with spinach and rice. You can also supplement your meal with sides of grilled asparagus, sweet potato purée, puréed black beans, green rice, and sautéed spinach. On a balmy evening on the patio, the obvious sipping choice is a margarita. Doña Tomás' bright, bracing rendition is worthy of the occasion, involving El Tesoro silver tequila shaken with fresh lime juice and Cointreau and served nontraditionally in a tall ice-filled glass. (The Doña Colada, a sweet, creamy frappé of rum, lime, and coconut, is another yummy tropical-vacation option.) In addition to the Tesoro, the bar offers an impressive 33 tequilas for sipping or shooting, ranging from $8 Herradura to $16 Clase Azul Reposado; three are available in an $18 sampler flight. There are seven mezcals as well (a flight of four is $25), plus ten Mexican beers and ten primarily local wines by the glass ($8-$13) or bottle ($28-$60). Nonalcoholic beverages include organic coffee drinks, Mexican sugar-cane Coca-Cola, hibiscus iced tea, and spicy, creamy Mexican chocolate, served in an enormous steaming bowl. But the house agua fresca de la dia in blood orange was on the pallid side and lacked the bite and bliss we were hoping for — a recurring theme at an otherwise exceptionally pleasant warm-weather destination.